It’s that time of year again when so many kids are getting sick with colds/the flu and those lingering coughs that never seem to go away. We all know how much stress it can put on the family from the sleepless nights and the emotional stress of wanting our kids to feel better. Stress on the nervous system, as well as a suppressed immune system, can have such an impact on this. Here’s how to make sure these systems are functioning at their best, allowing these kids to kick the sick quicker! When you have a cut, what happens? How does it scab over and heal? What controls the healing of your body? Your brain! How does your brain communicate to your cut that it needs to send blood cells there to heal it? Through your nervous system. What protects your nervous system? Your spine. So do you think if your nervous system is interfered with through misalignments of the spine, it might take longer for your body to heal that cut? You live your life through your nervous system. It is so important for your nervous system to functioning optimally! 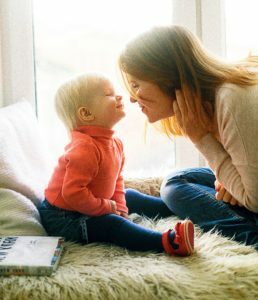 Children and infants get nerve interference within the nervous system through everyday play and stresses on the body. However, most people don’t realize how traumatic the birthing process is. Today’s birthing world is not easy on the mom or on the baby, especially with the interventions at birth, whether that’s by C-section, forceps, or induction. There is a tremendous amount of pressure, I’m talking 60-90 lbs of pressure, that is put on the infant’s neck with the birth process. When this amount of force is put on an infant’s spine, it can cause the bones, especially in the upper part of the neck, to misalign and lock up. The locking up of these bones in the upper portion of the neck causes mixed signals to the brain. These mixed signals are decreased proprioception, which is what allows our brain to know exactly what’s going on in the physical realm at any given second. It is what calms and relaxes the senses, making the brain more efficient. This locking of the bones also causes increased nociception. Nociception is the bad stuff, the loud, stress-causing annoyance. It’s loud noise within the brain that negatively alters perception and causes disorganization within the brain. This is what the brain is learning at such an early stage in life when these subluxations or misalignments of the spinal bones occur. It’s sending these stressful, disorganized noise signals to the brain, and the brain gets stuck and wired this way. These mixed signals cause an imbalance in the nervous system and this is what’s known as dysautonomia. The subluxation is precieved as stress when the perception of it reaches the brain, which activates the sympathetic response. The brain and nervous system are the air traffic control center for the body and there are 2 modes of operation for it. You have a gas pedal, sympathetic (fight or flight mode) and a brake pedal, parasympathetic (rest and digest mode). Subluxations, especially in the upper part of the neck, stimulate the sympathetic, fight/flight mode. 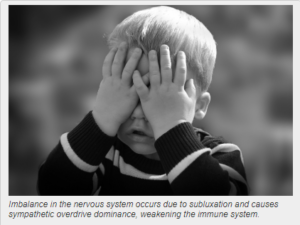 A gentle, specific chiropractic adjustment for children strengthens and balances immune function. It re-regulates the nervous system and decreases the stress and sympathetic response. This allows the body the ability to adapt and respond to whatever it may be trying to fight off. 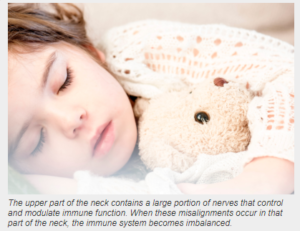 This is why I will always recommend coming in and getting adjusted when you feel a cold coming on, or when you see your child is starting to get sick. There’s no getting around being sick at times, but making sure the nervous system is functioning optimally to allow the immune system to balance will increase your chances of being able to fight that sickness off in a much quicker time.